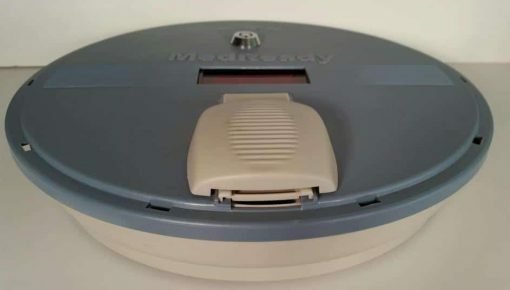 MedReady 1700PRN Free Shipping | MedReady Inc.
SKU: 1700PRN. Categories: Medication Dispensers, Non-Monitored Medication Dispensers. Tags: Dispensers, Pill Dispenser. The MedReady 1700PRN dispenses medication for the typical PRN medication regimen. PRN dispensing simply limits the time between doses. This dispenser lets you preset the minimum time between doses from 15 minutes to 24 hours. Upon accessing a single dose of medication, a visible preset countdown timer starts which indicates how long before the next dose is available. When this timer reaches 0:00, the next available dose becomes available. Note that to make it a true PRN (as needed) device, we do not sound any alarms indicating the next dose is available. When the patient needs medication, and the countdown timer since the last dose has reached 0:00, they are able to access their next dose. This also resets the countdown (until next dose) timer. The dispenser holds up to 28 doses of medication, and each dose compartment can hold up to 9 M&M size pills. The 1700PRN package comes complete with A/C Adapter, Rechargeable Battery, Medication Tray, Blue Locking Lid, and 2 keys. Note that many PRN regimens involve the dispensing of narcotics. The MedReady 1700PRN is tamper resistant, but it is NOT a medication Safe or Vault. With enough determination a patient will be able to break into the device and access more than intended. Under normal use, only one dose is available at any one time. My son can’t take meds closer than 4 hours but it’s OK if he takes them 8 or 10 hours apart because he only needs to take them when he feels he needs them. The 1700PRN works like a charm giving him a true as needed dispensing and freeing up my time. MedReady’s “one less argument” clam is really true.